Are we alone in the universe? The ultimate question of life beyond Earth and the solar system takes center stage in a science conference led by the Vatican Observatory and a University of Arizona this week. Nearly 200 scientists are attending the conference, called "The Search for Life Beyond the Solar System: Exoplanets, Biosignature & Instruments," which runs from March 16 through 21 in Tucson, Ariz. The Vatican Observatory is co-hosting the conference with the University of Arizona's Steward Observatory. 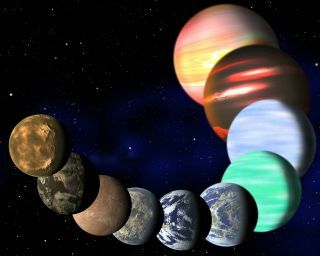 According to the organizers, the conference will cover the technical challenges of finding and imaging exoplanets and identifying biosignatures in the atmospheres of far-flung worlds. Other presentations will discuss the study of life forms that live in extreme environments on Earth, which could be apt analogs for life on other planets. The Habitable Exoplanets Catalog now list a dozen object of interest as potentially habitable worlds with the addition of two planets, Gliese 667C e and f (Gliese 667C c was known since early 2012). Image released June 25, 2013.